This entry is part 11 of 23 in the series Portugal & Andalusia 2012. The first overnight stop on our road-trip through Andalusia was in the small but historically rich city of Ronda, Spain. 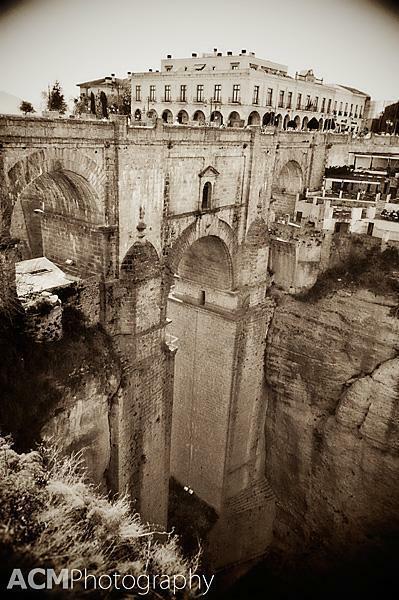 Ronda is famously cut in half by the Guadalevín River, which carved out the El Tajo canyon. 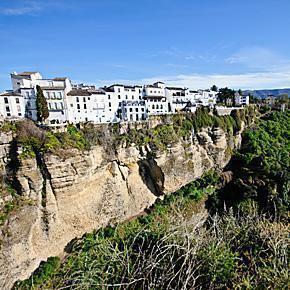 Ronda’s Old Town is precariously perched on the cliffs of the 100-metre canyon and is the perfect stopping place on a tour of the Pueblo Blancos of Andalusia, Spain. 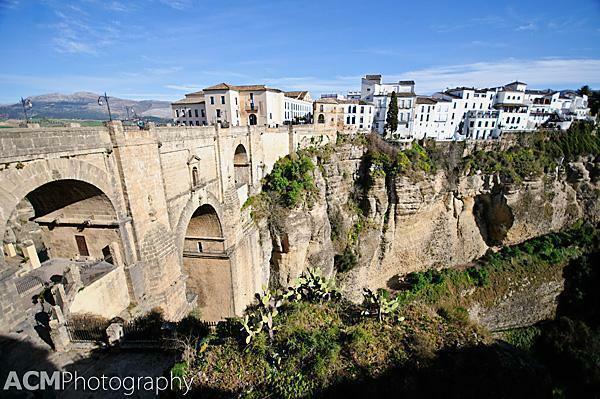 The Old Town of Ronda is joined by three bridges, the Puente Romano, or Roman Bridge, the Puente Viejo, or Old Bridge, and the most famous, the Puente Nuevo or New Bridge. The Puente Nuevo is not as new as its name would lead you to believe. Construction began in 1751 and wasn’t completed until 1793. It is the tallest of the three bridges and towers 120 metres (390 ft) above the canyon. Tourists, ourselves included, flock to this bridge in the evening, to watch the sun set over the rolling hills of Andalusia. 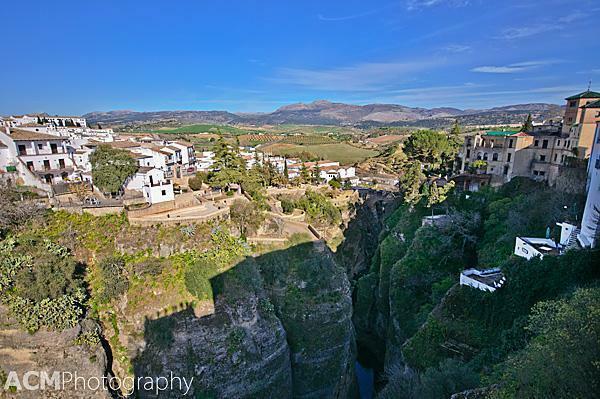 The view out over the countryside is surpassed only by the view of the bridge spanning the canyon and the buildings of Ronda clinging to the cliff-side. Ronda’s unique position above the canyon made it an appealing stronghold to settlers. In fact, it was the Celts, in the 6th century BC, who founded Ronda, calling it Arunda. Today’s Ronda was settled by Romans but has been home to the Phoenicians, Visigoths and Arabs over the years. 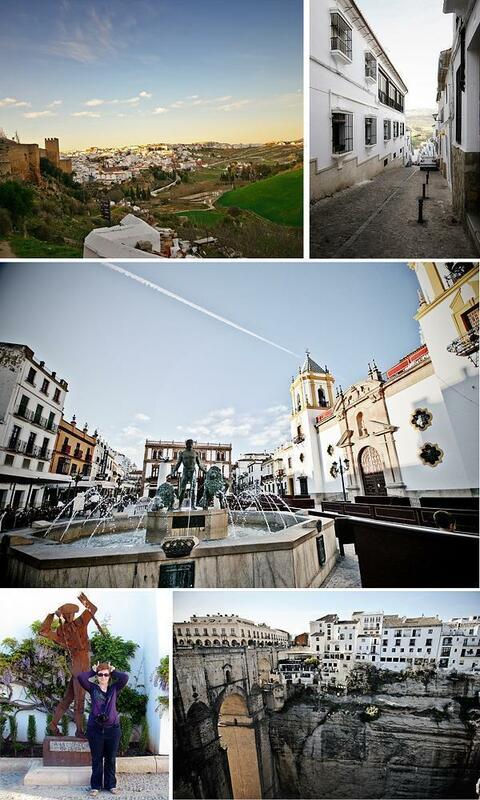 In fact, Ronda, like much of Andalusia, has a rich Islamic heritage that can still be seen in its architecture. For years, the city was the capital of a small Berber kingdom and was home to several famous poets and scholars of the Islamic world. In 1485, the Marquis of Cádiz captured Ronda and many of the remaining Muslims were forced out during the Spanish Inquisition. Islamic buildings were repurposed with Christian roles and the few Muslims who remained were persecuted and forced to convert. Those who resisted were killed or sold into slavery. 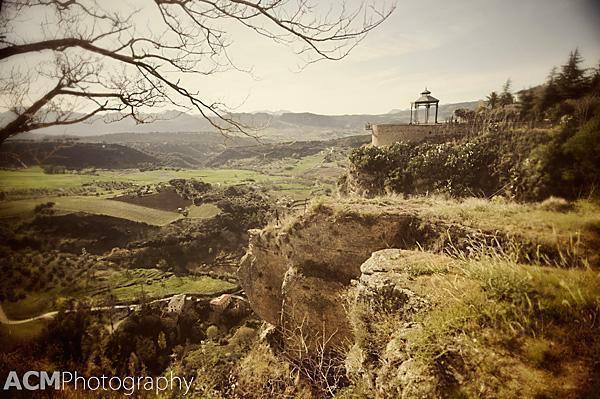 The people of Ronda also suffered heavily during the Napoleonic invasion and Peninsular War of the early 19th century when, in three years, the population was reduced by 10,000 people, leaving only 5,000 inhabitants. These days, Ronda’s population is around 35,000 citizens. Most of Ronda’s current population lives in the new town rather than the cliff-side Old Town seen here. However, the history of this city isn’t all bleak. 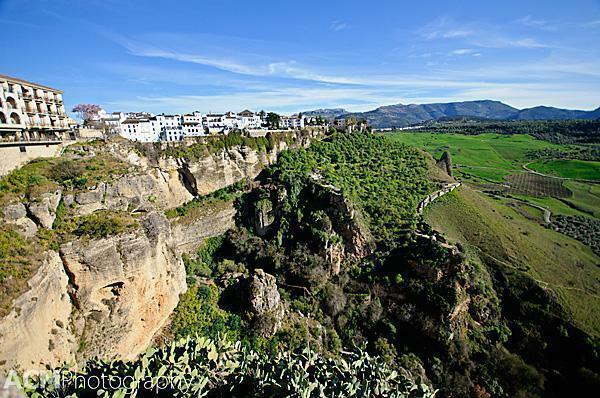 In fact, many great artists, poets and inventors lived in Ronda. Ernest Hemingway and Orson Welles both summered here and set some of their stories in the area. One of George Eliot’s characters was from Ronda and there is speculation Eliot’s ancestors may have originated there. The Andalusian flag and coat of arms were also designed in Ronda and, more recently, Giorgio Armani was inspired to design a costume for one of the famous bullfights. In fact, of all the cultural activities in Ronda, the most important was the development of modern bullfighting. Pedro Romero, who came from a long line of Ronda bullfighters, founded the tradition of facing the bull on foot, rather than on horseback. His family was also responsible for the use of the cape and a specially designed sword. The ‘Feria Goyesca de Pedro Romero’ honours this contribution to bullfighting and is one of Ronda’s most important festivals. It takes place throughout the first week of September and the festivities include a parade of 18th century costumes and culminate in a bullfight. Whatever your feeling are on the topic of bullfighting (and I’ll be honest in saying I’m against it), the cultural impact it has had on the city is undeniable and the museum at the Plaza de Toros de Ronda (or bullring) is worth a visit. 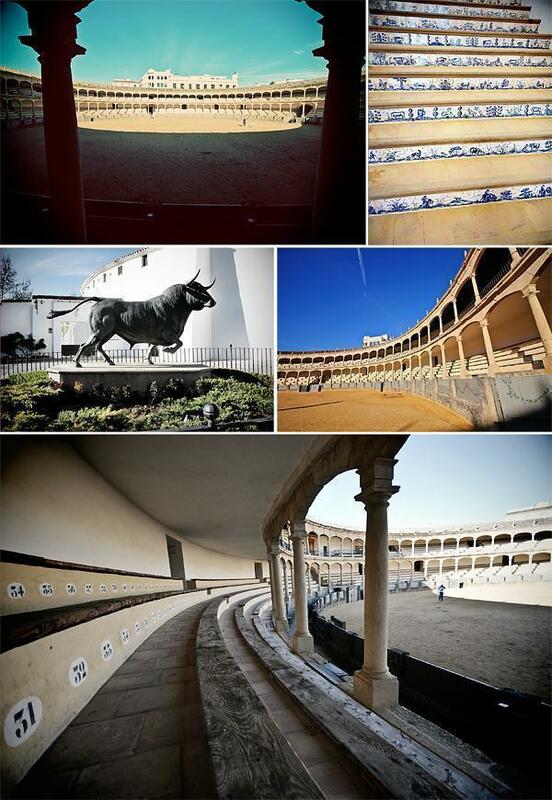 Completed in 1785, the Plaza de Toros in Ronda is one of the oldest operational bullrings in Spain. As a Madonna fan, I was interested to learn the video for her 1994 song Take a Bow was shot at the Plaza de Toros and starred real-life Andalusian bullfighter Emilio Muñoz. For us, one of the highlights of visiting Ronda was simply strolling through the quiet back streets and taking in the hum of Spanish life. It was a laid-back pause on our continuing road-trip of Portugal and Andalusia. Stay tuned for our next stop – the port city of Malaga, Spain.